That's right, it's a solar powered boat, with solar power being it's exclusive means of propulsion. At 31 meters long, 15 meters wide (and over 500 m2 of solar panels), it's not for your average owner, but still clearly illustrates the role that composites can play in lightweight, innovative design. 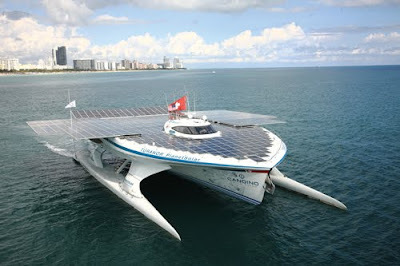 The ship, christened Tûranor, "is circumnavigating the world with the message of sustainable ship power." The irony of course, is that while the "power" (don't they really mean energy?) is "sustainable", none of the materials of construction are. Is wind not sustainable? Magellan's ship Victoria has this one beat by 489 years. Good point, although to be fair, I don't think that they are claiming to be first. what kind of fiberglass do you use to build this ship?